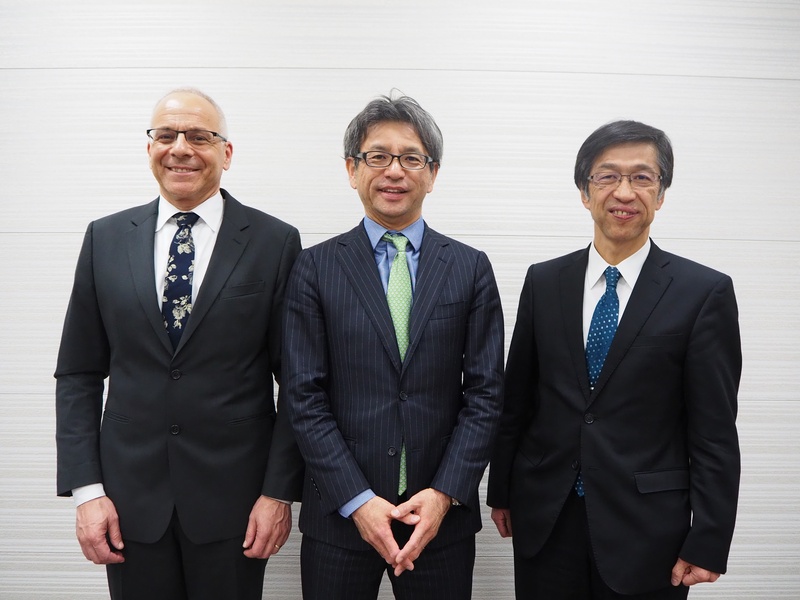 Tokyo, Japan, March 13, 2018—SanBio Group and Hitachi Chemical Co., Ltd. (Hitachi Chemical) jointly announced today that, through an agreement with Hitachi Chemical Advanced Therapeutics Solutions, LCC (HCATS; formerly PCT Cell Therapy Services, LLC), Hitachi Chemical’s U.S. subsidiary that engages in contract manufacturing and development of regenerative medicine products1, they will manufacture SB623, a proprietary regenerative medicine product under development by SanBio. Under the agreement, late stage clinical products and commercial products of SB623 for the US and Japanese markets will be manufactured using Hitachi Chemical’s global facilities. (Left to right) Robert Preti, Phd, General Manager, Hitachi Chemical Regenerative Medicine Business Sector and CEO and President, Hitachi Chemical Advanced Therapeutics Solutions, LLC; Keita Mori, MBA, President, SanBio Co., Ltd and Co-CEO and Chairman, SanBio, Inc.; Hisashi Maruyama, President and Chief Executive Officer, Hitachi Chemical Co., Ltd.
SanBio is developing and pursuing the rapid commercialization in Japan and the U.S. of its proprietary regenerative medicine product, SB623, as a new drug candidate for central nervous system disorders. Both the Phase 2b clinical trial of SB623 for the treatment of chronic motor deficit from ischemic stroke, which is being conducted in the U.S., and the Phase 2 global clinical trial of SB623 for the treatment of chronic motor deficit from traumatic brain injury (TBI), which is being conducted in Japan and the U.S., are progressing smoothly. Regarding the TBI program, based on the results of the Phase 2 clinical trial, SanBio intends to utilize the conditional and term-limited authorization system for regenerative medicine products under the Revised Pharmaceutical Affairs Act of Japan, allowing the company to deliver product in Japan earlier than in any other market in the world. In May 2017, Hitachi Chemical made HCATS (one of the leading contract manufacturing companies of regenerative medicine products in the US) a wholly owned subsidiary, and in April 2018, it plans to begin operation of its third global business base and one of Japan’s largest process development and contract manufacturing facilities in Yokohama City, Kanagawa Prefecture. SanBio and HCATS reached an agreement on contract manufacture of SB623, because Hitachi Chemical has established a manufacturing facility in Japan that fulfills a broad range of requirements from the manufacture of investigational regenerative medicine agents2 to that of commercial regenerative medicine products3 by utilizing the production control systems and manufacturing equipment of the whole Hitachi Group companies. Hitachi Chemical aims to harness the contract manufacturing technology and know-how of HCATS to operate a contract manufacturing business of regenerative medicine products not only in Japan but globally, including North America and Europe. 1 Products used for the prevention or treatment of disease, made from the cells of humans or animals that have been processed in some way, such as culturing. 2 Manufacture of agents under development used in clinical trials to evaluate therapeutic effects prior to approval by regulatory agencies such as the Japanese Ministry of Health, Labour and Welfare (MHLW) and the U.S. Food and Drug Administration (FDA) as a pharmaceutical product. 3 Manufacture of products approved for commercial sale by regulatory agencies such as MHLW and FDA. Hitachi Chemical Co., Ltd. (TSE：4217), headquartered in Tokyo, Japan, delivers a wide range of innovative products, such as electronic materials, automobile parts, energy storage devices and systems, in global markets. The company’s consolidated revenues for fiscal 2016 (ended March 31, 2017) totaled 554 billion yen ($4.9 billion). For more information on Hitachi Chemical, please visit the company’s website at http://www.hitachi-chem.co.jp/english/. PCT is the global cell therapy manufacturing and development service platform of the Hitachi Chemical Regenerative Medicine Business Sector, leveraging nearly two decades of PCT platform experience exclusively focused on the cell therapy industry. The PCT Service Platform includes contract development and manufacturing organization (CDMO) services at current Good Manufacturing Practices (cGMP) standards, including clinical manufacturing, commercial manufacturing, and manufacturing development. Hitachi Chemical’s development and manufacturing facility in Yokohama City, Kanagawa Prefecture, providing the PCT Platform, will begin full operation in April 2018 as the largest scale facility of its kind in Japan. U.S. facilities providing this service platform are already in operation in New Jersey and California. Hitachi Chemical Advanced Therapeutics Solutions, LLC (HCATS), is a wholly owned subsidiary of Hitachi Chemical Company, Ltd. (Hitachi Chemical) representing Hitachi Chemical’s Regenerative Medicine Business Sector in the United States. More information about the PCT Services Platform is available at http://www.pctcelltherapy.com.